The Hospital for Sick Children (SickKids) is situated in one of the most diverse cities in the world. This is reflected in the patient population it serves. In 2009, the hospital embarked on a quality improvement initiative to address the existing evidence base on health disparities and to enhance health equity through cultural competence programming. The goal was to achieve optimal health outcomes for all patients and families, with a particular focus on new immigrant and other vulnerable populations. Evaluation results indicate changes in clinical practice as a result of this initiative and increased patient satisfaction with regard to staff members' level of cultural sensitivity. This article provides an overview of this hospital-wide initiative, as well as the evaluation methods and outcomes. Based on a needs assessment, we developed an institutionally meaningful curriculum with SickKids' values of family-centred care, patient safety and service excellence embedded in the program. Educational sessions were delivered to clinical and non-clinical hospital staff, focusing on health disparities, the case for culturally competent care and practical tools for healthcare practitioners. Organizational change strategies, including the use of champions as change agents and role models, were used to embed cultural competence as integral to family-centred care at SickKids. Canada receives more than 200,000 immigrants every year, which accounts for around 60% of the population growth (Ng et al. 2005). In the past few decades, there has been a pronounced change in immigration trends, with a significant shift in source countries from European to non-European. Table 1 provides an overview of the magnitude of this shift. Toronto, Ontario, is one of the most diverse cities in the world, with a majority of immigrants hailing from visible minority communities. According to the Employment Equity Act, "members of visible minorities" are those, other than Aboriginal peoples, who are non-white in colour and non-Caucasian in race (Department of Justice 1995). Forty-seven percent of Torontonians identify themselves as belonging to a visible minority community (City of Toronto 2011). The five largest visible minority immigrant groups are Chinese, South Asians, Blacks, Filipinos and Latin Americans (Statistics Canada 2008b). Research has shown that Canada's newest settlers are subject to health disparities and health inequities (Beiser and Stewart 2005; Villeneuve 2002). Evidence indicates that quality of care can be compromised when healthcare providers do not respond appropriately to language and cultural factors impacting health and health behaviour (Green et al. 2002; Kirmayer 2006). Culture influences concepts of health and illness, symptoms of distress and help-seeking behaviour (Ivanov and Buck 2002; Kirmayer and Looper 2006). Healthcare professionals and organizations need to work with this understanding to provide appropriate care to diverse communities. Patient- and family-centred care, which is central to the mission of healthcare organizations such as The Hospital for Sick Children (SickKids), can be optimally realized only if the needs of diverse families are addressed in an equitable manner. In the field of child health, factors that are influenced by culture, such as parenting practices, decision-making with regards to child health and bereavement practices of families, require specific attention. 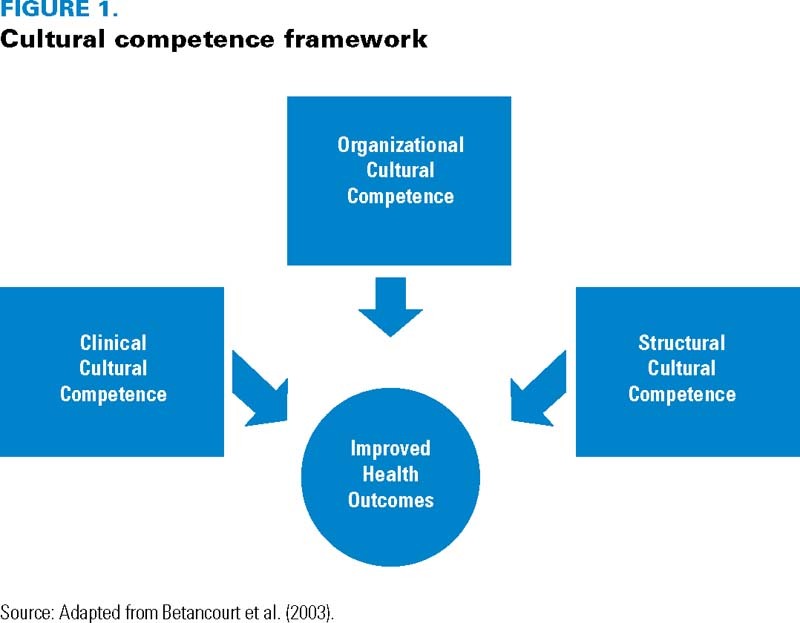 Cultural competence is therefore critical to providing quality, safe and family-centred care. It is increasingly evident that the provision of quality care in the context of diversity is a complex issue that requires additional effort. The system and services put in place when healthcare organizations were established were Eurocentric in nature – designed to cater to a very different population demographic than the present one. The dominant culture orientation of healthcare professionals also acts as an impediment to responsive care for diverse populations (Hussain 2006). The vision of healthcare organizations that strive toward optimal health outcomes for all necessitates a movement from "equality in services" to "equity in services," a movement that embraces the concept of cultural competence as integral to responsive service delivery in multicultural contexts. The seminal definition as proposed by Cross et al. states that cultural competence is "a set of congruent behaviours, attitudes, and policies that come together in a system, agency, and among professionals, and enables … [them] to work effectively in cross-cultural situations" (1989: 4). A more recent definition underscores that cultural competence is the capacity to function effectively as an individual and an organization within the context of the cultural beliefs, behaviours and needs presented by consumers and their communities (US Department of Health and Human Services [USDHHS], Office of Minority Health 2005). Internationally, the need for cultural competence in healthcare is garnering increasing attention and leading to specific action. The United States, for example, has implemented the National Standards on Culturally and Linguistically Appropriate Services in Health Care (USDHHS, Office of Minority Health 2001). Australia has developed the National Cultural Competency Tool for Mental Health Services, which contains a set of National Cultural Competency Standards and a range of practical aids and strategies, including tools for organizational assessment (Multicultural Mental Health Australia 2011). Located in the heart of downtown Toronto, SickKids is the largest pediatric academic health sciences centre in Canada, providing tertiary and quaternary care to the sickest and most vulnerable children provincially, nationally and internationally. It champions the development of an accessible, comprehensive, responsive and sustainable child health system that is centred on core values of family-centred and compassionate care. Situated in one of the most diverse cities in the world, it serves a highly multicultural patient population and provides interpretation services in more than 50 languages. Annually, there are over 50,000 emergency department visits, 200,000 visits to the outpatient clinics and 14,000 in-patient stays. Health equity is a key priority for SickKids, and the cultural competence initiative is reflective of this priority. 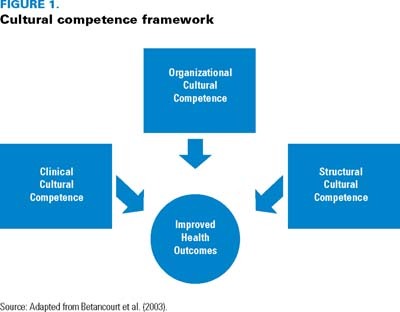 This article highlights the holistic approach to cultural competence employed by SickKids that enables the integration of organizational, clinical and structural-level cultural competence, leading to sustainable outcomes. The model employed is adapted from an existing practice framework of cultural competence (Betancourt et al. 2003). An education strategy, undertaken as part of the larger cultural competence initiative, is used to expand on the application of the adapted model. While the primary objective of the initiative was to increase cultural competence of staff to improve quality of care, the initiative was implemented with the understanding that change cannot happen in isolation. Therefore, there were many elements beyond education that informed the initiative (Figure 1). Organizational cultural competence is reflected in policies, practices and structures that enhance work efficiency in cross-cultural situations; it requires the organization to value and adapt to diversity, manage the dynamics of differences and institutionalize cultural knowledge (Olavarria et al. 2005). At SickKids, investing in diversity initiatives, implementing policy- and program-level changes, articulating a clear need for cultural competence to enhance health equity and creating an environment conducive to new learning, have demonstrated an organizational commitment to promoting quality and safe care through culturally competent care. The New Immigrant Support Network (NISN) was established at SickKids through funding received from Citizenship and Immigration Canada in April 2009, with the aim of improving access to quality healthcare and health information for newcomers via the provision of cultural competence education to healthcare providers and through the translation of patient education materials in up to nine languages. NISN partnered with multiple stakeholders and departments and worked closely with members of the senior management team to enact this vision. The foresight of the organization in creating an exclusive vehicle to power the initiative provided the opportunity to allocate dedicated time, resources and expertise; this is much needed in healthcare environments where staff resources are always challenged due to direct service delivery pressures. The approach of NISN was to drive the process, to build capacity within the organization and individual departments in such a manner that cultural competence has become an integral element in the provision of family-centred care. The organization signalled to its staff and stakeholders that cultural competence is a high priority by having a member of the senior management team champion the initiative and by allowing protected time for staff from different departments to attend the cultural competence education and training. Culture plays a significant role in the interaction between patients and families and their healthcare providers. The cultural competence education program is based on the premise that understanding and providing culturally competent care is a strategy to reduce health disparities and enhance health outcomes of many cultural groups (Canadian Nurses Association 2004). It focused on developing a cultural competence curriculum and delivering workshops at multiple levels to clinicians and other hospital staff who have contact with children and their families. While in many cases the education in itself is an end, rather than a means, putting into question the purpose and the long-term impact of such initiatives, this program chose to clearly outline the goals that the education program was set to achieve: to enable clinicians and other staff to provide culturally competent care and services; to conduct appropriate clinical assessments of newcomer patients' and families' healthcare needs; and to improve newcomer patient access to culturally competent care within the organization. The development of the curriculum started with an organizational needs-assessment process that helped align the approach to cultural competence within a framework that reflected the core values of the organization and made it locally meaningful. This was followed by needs-assessment focus group discussions with staff to facilitate designing a curriculum that was relevant to participants' needs, challenges, experience and practice. These focus groups also served the purpose of engaging the staff and creating an interest in the area of cultural competence. Based on these consultations, cultural competence learning modules were individually tailored for different staff groups: clinical staff, non-clinicians, service staff and managers. In all, 173 workshops were delivered and reached over 2,100 staff. The workshops ranged from four-hour sessions for non-clinical staff to two-day events for clinical staff. The learning strategy – using standardized patients, a method involving role play in which professional actors play the part of patients and their families and interact with staff in simulated scenarios – was designed to reinforce the concepts presented in the sessions by putting them into practice in a simulated and safe environment. Structural cultural competence can be defined as the changes to systems and processes within an organization that enhance its capacity to function in a culturally competent manner. A number of projects focusing on structural cultural competence were implemented through this initiative. One key project focused on the placement and implementation of 12 kiosks that provide in multiple languages and directions to help patients and families find their way around the hospital. Additionally, as part of a six-month pilot project, the patient satisfaction survey was translated into seven languages and used to survey families identified during their hospital visit as having limited English proficiency. The results of these surveys will be valuable in determining how effectively the hospital meets the needs of this population and in implementing quality improvement plans to address any gaps. Research indicates that language barriers have a detrimental impact on the quality of care and patient safety. Through the cultural competence initiative, systems and tools have been put in place to enhance the awareness of, and access to, existing face-to-face and telephone interpretation services. The education workshop promoted the use of a cultural assessment tool that increased clinician sensitivity to the language needs of children and their families, thereby encouraging the use of interpreter services in a timely and responsive manner. This has resulted in a significant increase in the use of interpreter services. The cultural competence workshop for managers addressed program-level factors, such as access, engagement, and outreach, that program managers need to consider while tailoring their programs to respond to the needs of a multicultural patient population. Finally, the establishment of a Champions Program was instrumental in the dissemination of information related to the cultural competence activities being implemented. About 100 cultural competence champions representing various clinical and non-clinical areas across the hospital received advanced education in cultural competence and acted as change agents and role models in the delivery of culturally competent care and service. A comprehensive, multi-pronged evaluation strategy was used to determine the effectiveness of the cultural competence initiative. This section focuses specifically on some of the evaluation activities related to the education initiative. A head count determining discipline- and department-specific participation in the workshops was important in ascertaining weak spots and resistance within the organization toward the initiated change. Over 2,100 hospital staff – primarily clinicians – attended the workshops. The activity evaluating commitment to change entailed asking participants to record three things that they would do differently as a result of having attended the workshop. This activity is an education intervention as it has been shown to promote behaviour change (White et al. 2004) and is also a means of evaluating intended and actual change following an intervention. About 800 workshop participants completed the commitment-to-change activity, and 2,542 commitments were documented. In analysis, the congruence between the workshop objectives and commitments that participants made were assessed and grouped by theme. Key themes included practice change, belief or attitude change and continuing education related to culture and culturally competent care. Fifty-four participants were followed up and interviewed three months following the workshops about their challenges and successes in carrying out their commitments. Seventy-eight percent of commitments documented by these participants had been achieved, and participants indicated intent to act on another 16% of commitments. 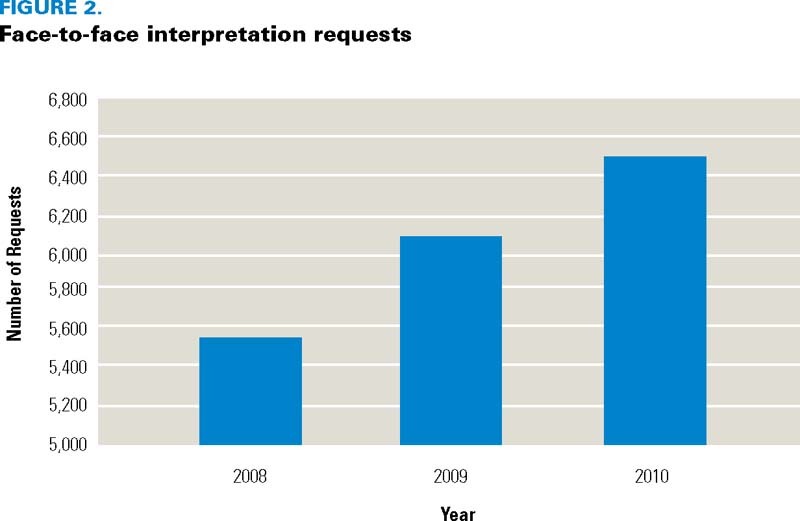 Change in interpreter service use (Figure 2 and 3) was measured as an indicator of practice change. 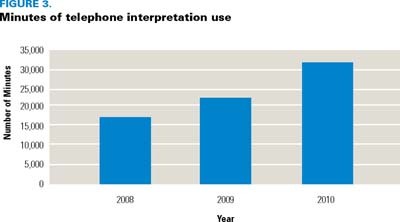 Results show a significant increase in the use of face-to-face interpretation and a doubling of the number of minutes of telephone interpretation use since the implementation of the cultural competence education workshops. Finally, a review of the patient satisfaction survey results validates practice changes and enhancements in culturally competent care. Results indicate a more than 5% increase in satisfaction to the question, "Were hospital staff members sensitive to your (your child's) special cultural needs or concerns?" The linkages between organizational, clinical and structural aspects of a system protect an endeavour from the threats of temporality of stand-alone initiatives and embed them into the core of the vision and function of the organization and its staff, as evidenced in the cultural competence initiative. The creation of the cultural competence champion role and the outcomes of the commitment-to-change evaluation activity are but two indicators of sustainable change. The development of the Cultural Competence Series of e-learning modules and an educational film on cultural competence provide an ongoing platform of learning. Finally, the recent establishment of a portfolio with a mandate to focus on health equity will further ensure sustainable change. In order to more broadly impact the child health system in the province, the lessons learned and the resources developed through the cultural competence initiative are being shared with other healthcare organizations across Ontario. Two-day train-the-trainer workshops were offered and were attended by over 100 participants representing 45 organizations. The workshop and the training manual were designed to orient educators and leaders to specific considerations in the development, implementation and evaluation of a cultural competence program. The sessions included information on resources available, including the patient education materials and child health information translated into various languages and made available online. Evaluation of these sessions revealed that participants intended to take the information back to their settings and implement change aimed at increasing their organization's level of cultural competence. Over the next two years, SickKids will continue to provide these workshops and consultation and support to organizations interested in advancing culturally competent care in their own settings. An online cultural competence community of practice will be created to facilitate discussion and an exchange of ideas. The series of e-learning modules and film will also be shared widely. Toronto and indeed Canada are becoming increasingly diverse as immigration contributes significantly to population growth. Changes in immigration patterns have led to an increasing number of visible minorities calling Canada home. In order to provide equitable and quality care, it is important to understand and respond to cultural factors that influence concepts of health and illness, health behaviour and help seeking. Cultural competence is therefore integral to providing quality care to patients and their families in a multicultural environment. This initiative has demonstrated that integrating cultural competence into the organizational, clinical and structural facets of a healthcare organization is necessary to create a responsive and inclusive system of care. A clear articulation of intent by hospital leadership, which is then supported by focused investment of resources, is required. Sustainability planning and continuous evaluation are vital to such initiatives that tread new ground. Policies at the forefront of cultural competence should (1) address staff orientation and staff development to include cultural competence, (2) present clear guidelines and enhanced access to interpretation services, (3) delineate standards for culturally competent care and (4) emphasize a strong diversity research mandate. From a human resources perspective, hiring a diverse workforce at all levels and integrating cultural competence evaluation into standard performance evaluation will enhance organizational cultural competence significantly. Cultural knowledge that is institutionalized through effective education will enhance programs and lead to equitable healthcare. While organizational endeavours are critical, the vision for culturally competent healthcare should move beyond organizations and be reflected as federal and provincial level policies and programs for there to be lasting and sustainable change that will result in equitable healthcare for our diverse communities across Canada. Learning from other jurisdictions, establishing benchmarks and setting standards related to the delivery of culturally competent and equitable healthcare are warranted and a way forward. Karima Karmali, RN, BScN, MBA, director, Centre for Innovation and Excellence in Child and Family-Centred Care, The Hospital for Sick Children (SickKids), Toronto. Linda Grobovsky, BA, MEd, previously worked with the New Immigrant Support Network, The Hospital for Sick Children (SickKids), Toronto. Jennifer Levy, BA, MSc, PhD, previously worked with the New Immigrant Support Network, The Hospital for Sick Children (SickKids), Toronto. Margaret Keatings, RN, MHSc, chief interprofessional practice and chief nurse executive, The Hospital for Sick Children (SickKids), Toronto. Beiser, M. and M. Stewart. 2005. "Reducing Health Disparities: A Priority for Canada." Canadian Journal of Public Health 96: S4–S5. Betancourt, J.R., A.R. Green and O. Ananeh-Firempong. 2003. "Defining Cultural Competence: A Practical Framework for Addressing Racial/Ethnic Disparities in Health and Health Care." Public Health Reports 118: 293–302. Canadian Nurses Association. 2004. Position Statement, Promoting Culturally Competent Care. Ottawa, ON: Author. City of Toronto: Toronto's Racial Diversity. Retrieved July 7, 2011. <http://www.toronto.ca/toronto_facts/diversity/htm>. Cross, T., D. Bazron and M. Issacs. 1989. Towards a Culturally Competent System of Care. Washington, DC: Georgetown University Child Development Center. Department of Justice. 1995. Employment Equity Act. Ottawa, ON: Author. Retrieved August 16, 2011. <http://laws-lois.justice.gc.ca/eng/acts/E-5.401/FullText.html>. Green, G., H. Bradby, A. Chan, M. Lee and K. Eldridge. 2002. "Is the English National Health Service Meeting the Needs of Mentally Distressed Chinese Women?" Journal of Health Services Research and Policy 7(4): 216–21. Hussain, N. 2006. "Culturally Determined Care Goals and Efficacy of Statutory Services." International Journal of Qualitative Studies on Health and Well-Being 1(1): 149–58. Ivanov, L.L. and K. Buck. 2002. "Health Care Utilization Patterns of Russian-Speaking Immigrant Women across Age-Groups." Journal of Immigrant Health 4(1): 17–27. Kirmayer, L.J. 2006. "Beyond the 'New Cross-Cultural Psychiatry': Cultural Biology, Discursive Psychology and the Ironies of Globalisation." Transcultural Psychiatry 43: 126–44. Kirmayer, L.J. and K.J. Looper. 2006. "Abnormal Illness Behaviour: Physiological, Psychological and Social Dimensions of Coping with Distress." Current Opinion in Psychiatry 19(1): 54–60. Multicultural Mental Health Australia. 2011. National Cultural Competency Tool for Mental Health Services. Parramatta, Australia: Diversity Health Institute. Retrieved July 7, 2011. <http://www.dhi.gov.au/Multicultural-Mental-Health-Australia/Program-Areas/Workforce-Development/NEW-National-Cultural-Competency-Tool-for-Mental-Health-Service/default.aspx>. Ng, E., R. Wilkins, F. Gendron and J.M. Berthelot. 2005. Dynamics of Immigrants Health in Canada: Evidence from the National Population Health Survey (Catalogue No. 82-618-MWE2005002). Ottawa, ON: Statistics Canada. Olavarria, M., J. Beaulac, A. Belanger, M. Young and T. Aubry. 2005. A Report Prepared for Centre Town Community Health Centre. Ottawa, ON: Organisational Cultural Competence: Self-Assessment Tools for Community Health and Social Service Organisations. Statistics Canada. 2007. Immigration in Canada: A Portrait of the Foreign-Born Population, 2006 Census (Catalogue No. 97-557-XIE). Ottawa, ON: Statistics Canada. Statistics Canada. 2008. 2006 Community Profiles. Accessed July 7, 2011. Ottawa, ON: Author. <http://www12.statcan.ca/english/census06/data/profiles/community/index.cfm?Lang=E>. US Department of Health and Human Services, Office of Minority Health. 2001. Final Report: National Standards for Culturally and Linguistically Appropriate Services in Health Care. Washington, DC: Author. US Department of Health and Human Services, Office of Minority Health. 2005. What Is Cultural Competency? Washington, DC: Author. Retrieved June 9, 2006. <http://minorityhealth.hhs.gov/templates/browse.aspx?lvl=2&lvlID=11>. Villeneuve, M. 2002. "Healthcare, Race, and Diversity: Time to Act." Hospital Quarterly 6(2): 67–73. White, M., S. Grzybowski and M. Broudo. 2004. "Commitment to Change Instrument Enhances Program Planning, Implementation and Evaluation." Journal of Continuing Education in Health Professions 24: 153–62. Cultural competency training can enable staff to provide the best of care.